This is the will of Isaiah Pemberton, born 27 Dec 1756, Newberry, South Carolina and died 2 February 1801. The will was written 18 Jan 1801 and proven 2 Feb 1801 and recorded in Will book C., page 151 on 13 April 1801 by Samuel Lindsey Ordinary of Newberry District in Box No. 16, Pkg. 34, Est. No. 365. Will disburses a total of 250 acres in two parcels. The will states that his plantation was next to that of Richard Pemberton. The image of this will is not the original, but of a transcription done ca 1930 as part of a make work project. First My desire is that all my just debts and funeral charges be justly and timely paid before any other division or division of my estate take place. 2nd I leave unto My Beloved Wife Hesther Pemberton all my Estate both real and personal during her natural life. 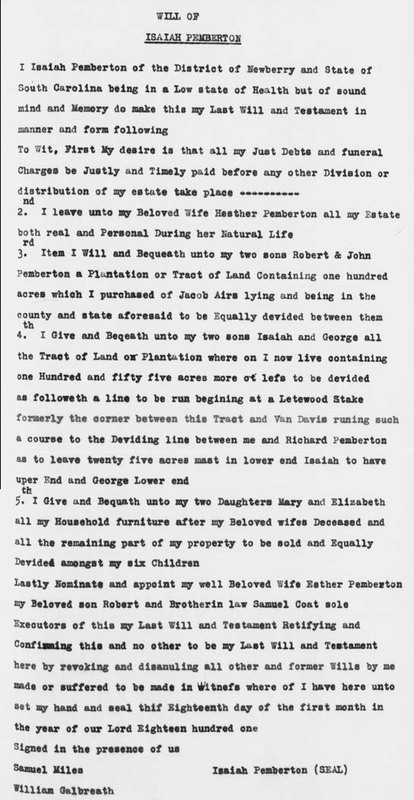 3rd Item I Will and Bequeath unto my two sons Robert & John Pemberton a Plantation or Tract of land containing one hundred acres which I purchased of Jacob Airs lying and being in the county and state aforesaid to be Equally divided between them. 4th I Give and Bequeath unto my two sons Isaiah and George [T] all the tract of land or Plantation whereon I now live containing one hundred and fifty five acres more or less to be divided as followeth a line to line run beginning at a Letewood stake formerly the corner between the tract and Van Davis running such a course to the Dividing line between me and Richard Pemberton as to leave twenty five acres most in lower end. Isaiah to have upper and George lower end. 5th I Give and Bequeath unto my two Daughters Mary and Elisebeth all my Household furniture after my Beloved wife’s decease and all the remaining part of my property to be sold and Equally Divided amongst my six children. Lastly nominate and appoint my well Beloved wife Esther Pemberton my beloved son Robert and Brother in law Samuel Coate sole Executor of this my Last Will and Testament Ratifying and Confirming this and no other to be my Last Will and Testament hereby revoking and disannuling all other and former Wills by me made or suffered to be made in Witness whereof I have hereunto set my hand and seal This day Eighteenth day of the first month in the year of our Lord Eighteen hundred one.